Daily departures - Morning, Afternoon, and Night. Opt for the evening tour and cruise if you can, try and time it so you see sunset! We are comparing Vintage 2CV Tour Plus 1 Hour Seine River Sightseeing Cruise Prices from leading ticket suppliers and Try to find you Cheap tickets prices on the market. The Citroen 2CV is an icon of the French motor industry. 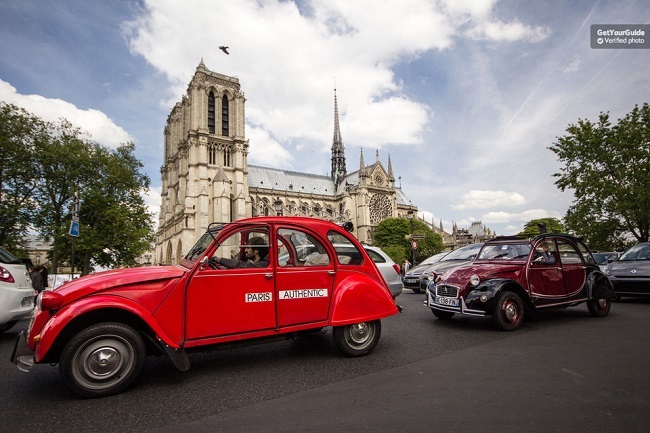 Built between 1948 and 1990 these beautiful cars have an instantly recognizable design that will get the people of Paris pointing as you're driven around by a beret-wearing chauffeur/guide on your sightseeing trip through the streets of Paris. The Les Bateaux Parisiens is a classic glass-covered boat (including glass ceiling) with open walkway that cruises up and down the River Seine on a 1 hour sightseeing cruise. Setting sail from the foot of the Eiffel Tower the round-trip boat tour passes the iconic sights such as The Louvre, Musée d'Orsay, Notre Dame Cathedral, The French National Assembly, Pont Neuf, Les Invalides, Grand Palaic and more. Learn about the sights you're passing on the river with audio commentary provided in 11 languages (English, French, Spanish, Chinese, Dutch, German, Italian, Japanese, Polish, Portuguese, and Russian) via headsets. The perfect way to experience Paris for first time visitors as well as those celebrating a special occasion. A must-do for any vintage car lover! A great introduction to Paris if you don't like walking! The kids will enjoy it too and kids under the age of 12 travel free on the 2CV driving tour. Your Experience With Vintage 2CV Tour Plus 1 Hour Seine River Sightseeing Cruise? You'll be collected from your hotel at the agreed time by your beret-wearing local Parisian driver who will be driving an iconic vintage 2CV vehicle. Hop in and get driven around the city in style as you take in all the sights. Your driver is open to suggestions if you know there's something you really want to do/see, and he'll also stop the car and take photos of you whenever possible. As well as driving he'll also act as your guide, giving you all the information about the sights your passing and showing you the most iconic sights as well as picturesque Paris. Your drive will end at the foot of the Eiffel Tower where you'll then hop aboard the classic Les Bateaux Parisiens glass sightseeing boat to witness the sights of Paris from the water. The boat tour has audio commentary in 11 languages provided via headsets so you'll get even more information on the sights of Paris, passing by the Louvre, Grand Palais, Notre Dame, and many more places on the River Seine. What Vintage 2CV Tour Plus 1 Hour Seine River Sightseeing Cruise Includes? 1 hour sightseeing tour with private driver/guide in a Citroen 2CV vintage vehicle. 1 hour sightseeing cruise on a classic Les Bateaux Parisiens boat. Book the champagne extra to make the car tour even more special. Travelers Reviews about Vintage 2CV Tour Plus 1 Hour Seine River Sightseeing Cruise? Travellers talking about this tour on Get Your Guide and trip advisor only have good things to say about it! A highlight of most peoples trip to Paris, they agree that the cruise perfectly compliments the car tour as you get to see the most iconic sights and places from the road and from the river truly being able to enjoy the best of both. Everyone agrees that the drivers are great, super friendly, knowledgeable, and experienced in driving these classic cars. They go out of their way to show you the heart of Paris and are happy to stop and take photos of you and will take into account where you want to go and what you want to see. Happy travellers describe the tour as "It was a fantastic kind of sightseeing in Paris. The best way I could imagine to explore the city. It's a real Must have for everyone." "The cruise complements the car tour perfectly as another perspective on the most important buildings along the Seine. All in all a wonderful experience!" "It was a good value and we got to see a lot. Very personal. The boat ride was on time and good." Do some planning and research to see if there's a particular area you want your driver to show you.